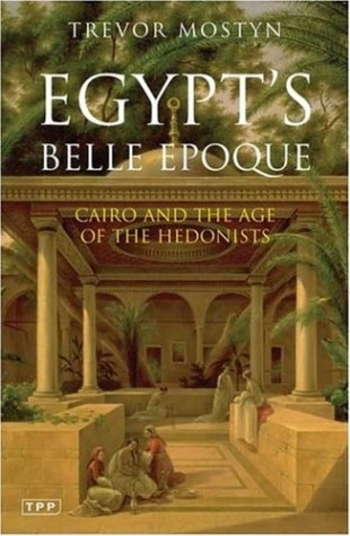 "Cairo and the Age of the Hedonists"
Cover of "Egypt's Belle Epoque: Cairo and the Age of the Hedonists." Cairo has a reputation these days for fundamentalism, anger, hatred, and the like, symbolically summarized by the 1994 stabbing in the neck of a Nobel-prize winning novelist for political reasons. So it was with mild shock that I took in the title of a newly-arrived paperback by Trevor Mostyn from Tauris Parke: Egypt's Belle Epoque: Cairo and the Age of the Hedonists. The book, originally published in the UK in 1989, offers a vivid evocation of the Egyptian capital between (roughly) the accession of Ismail in 1863 and the overthrow of his grandson Farouk in 1952. Mostyn gives a sense of the Europeans' grand life during those nine decades by quoting from journals, travelogues, press clippings, and the like. As a former resident of Cairo who first arrived in that extraordinary city in 1971, I am highly aware of this layer of the city's history. I lived in the part of town Ismail had constructed, I enjoyed the faded but still recognizable architecture of that period, I hobnobbed a bit with the French-speaking Turko-Egyptian elite, I whiled away afternoons at the Gezira Sporting Club, and I heard reminiscences from old-timers who recalled the monarchy. Huda Sha'rawi (1879-1947), Egyptian feminist. A century ago, European culture was on the march, building cathedrals, English-style clubs, Italianate palazzos, and French gardens in Cairo, while today mosques, Islamic cultural centers, madrasas, and interest-free banks are going up throughout the West. I lived on the Cairene street named after the feminist Huda Sha'rawi (1879-1947), famous for having publicly cast aside her face-covering in 1923, causing a national scandal; now, Egyptian women are anew covering their faces, often voluntarily. The Islamism so rampant today in Cairo was quite absent 35 years ago and may well be as weak in another 35 years. Apr. 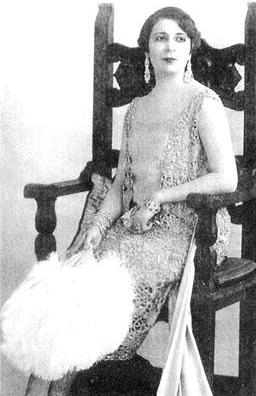 9, 2015 update: The Egyptian newspaper Al-Ahram recalls today a small but poignant aspect of Cairo in the age of hedonists: the roller-coaster life of Nazli Sabri (1894-1978) who "was the second wife of King Fouad, the mother of King Farouk, the lover and wife of a senior courtier and, eventually, a pauper living in California."